Do you know what the fastest running animal in the world is? If you said Cheetah, you are correct. Good Job! A Cheetah can run up to 75 mph. Why do you suppose God gave them the ability to run so fast? They need to run fast to catch their prey. Prey is another animal that they run after, catch, and take down in order to kill it and eat it. Cheetahs are meat eaters or carnivores. Their prey ranges from rabbits to antelopes. Cheetahs are felines or big cats. They have semi retractable claws which mean that they can pull their claws in partially under their skin. House cats can retract their claws all the way in. A Dog does not retract their claws. Cheetahs make many different sounds: chirping, growling yowling, and hissing. They even make a particular spitting sound which almost always is followed by a paw being forcibly hit on the ground. They do not roar like lions. Cheetahs are light brown with dark spots, and they have a long tail. After they run very fast, they have to rest. If they run very fast for a long stretch of time, they have to have a long rest time. They typically do not run far. Instead they run very fast for shorter distances. If they have killed an animal for food and a bigger animal comes to take it, they will give it up because they are afraid to fight. They have a fear of injuring themselves, causing them to not being able to run fast. If they cannot out run their prey, they will not be able to kill to eat and will eventually die. Do you know where their natural habitat is? Habitat is the place where they were born and live in the wild. They roam in Africa and southwestern Asia. You will find them living in Zoos also, but that is not their natural habitat. Some people have tamed them as pets or trained them for use as hunters for them. I would be frightened to have a cheetah as my pet. Wouldn’t you? Even though they are beautiful sleek animals, I still would not want to get too close! Chester is a cheetah who has surpassed all his family members as the fastest cheetah. He loves to run. He loves to race but more importantly he loves to win! Winning is fun isn’t it? I like to win a game of checkers or ping pong. I especially like to win in a game of air hockey! I like to play a game of HORSE in basketball, too. When I win it is more fun. Winning a spelling bee would be fun. Being on the winning team is always a rush. There is nothing wrong with winning or losing. It is in how you play and what your attitude is afterward that matters. Chester loves to win so much; it is about all he thinks about. He has worked hard to get his body and motion into perfect rhythm so he can win. He is always talking about himself and how fast he is. He brags about the races he has won. He makes fun of the cheetahs he has beaten. He is arrogant, proud, boastful. He thinks of himself better than anyone else. He will challenge anyone to a race because he knows he will win. He has never lost a race. You may be thinking Chester is so cool because he wins all the time. It is alright that he wins all the time, but it is not alright that he is mean about it. He brags about how fast he is. He retells the stories over and over again. He puts down his opponents, those who he has raced. He makes fun of the losers. He smirks at them. That means he has a proud look with a laugh in his eyes and a half smile on his lips. His attitude about winning and thinking he is best has overflowed into all areas of his life. He thinks he is so much better than any other cheetah he doesn’t respect any other cheetah, even his parents. He doesn’t think he needs to obey or do what is required of him. He doesn’t share his prey. He doesn’t help out in the family or community. He gets into trouble for his actions, but he just meets it with a smirk on his face and a laugh in his eye. This makes it hard for anyone to trust or like him. He is becoming an outcast and he doesn’t even notice. He is so wrapped up in himself, that he cannot see how others perceive him. The cheetahs have had enough of his attitude. No one takes up his challenge to a race, so he runs by himself trying to beat his own time. Eventually, he is almost exclusively all by himself because no one wants to be around someone who is so arrogant and proud. He is unaware of how the others feel about him because he is so caught up in himself. He does not realize the hurt he has caused to his family and the coalition, or group, of cheetahs he is in. When he tries to talk to another cheetah, he is ignored. They turn away and sometimes walk away from him. Instead of getting his attention, this only makes him feel even more superior, and he thinks they are just stupid. Chester struts around looking and acting superior to all other cheetahs. He didn’t always act this way. His pride grew in small amounts until he was this obnoxious acting cheetah that no other cheetah liked. There is a young cheetah in another coalition who has been practicing racing. He is getting faster and faster. One day, Chester heard another cheetah talking about this young cheetah and how fast he was. This peeked Chester’s curiosity. He went to watch this young cheetah, Norman, and saw how fast he was. He challenged him to a race. Norman refused. This made Chester mad and he called him names like: chicken, fraidy cat, wimp, and baby. Norman just walked away. Norman never called him names back or said anything rude. All the cheetahs that heard this liked Norman more and Chester less. “Everyone has special gifts or something they excel in. It doesn’t make anyone better than all others. It is just a race. I would rather be known for being loving and kind than the fastest runner.” said Norman then turned and walked back to his coalition. The race was set up with refs and record keepers. The route was mapped out and set for the following day. That night it rained hard. In the morning it was evident that there was mud and slippery parts on the route. Norman and the refs wanted to postpone the race for a drier day, but Chester was adamant he had to race that day. Adamant means he demanded it to be done and he was unyielding. They got to the starting line and into position. The starter started the race with a cheetah spit and his paw hitting the ground. Off they went! They were so fast it looked like a streak of light brown going by. The rout was windy with twists and turns up hill and down. On one of the biggest curves when they were neck and neck, which means they were at a tie, Chester got a little frightened he would not win. He took his eyes off the route and looked over at Norman. Chester slipped and slid right into Norman. They both slid down the hill and landed with a thud against a fallen tree! Norman got up and shook himself to clear his head. At first Chester did not move. Then slowly he tried to get up. His back right paw was stuck under the fallen tree and he couldn’t get free! He tried and tried to free himself and lay back exhausted from the effort. Norman could have left him right there and finished and won the race. Norman was not that kind of cheetah because he cared for others. He reached down and tried to lift the fallen tree. It would not move. So Norman started to dig. He dug and dug the mud and dirt from around Chester’s paw. Soon Chester pulled his paw loose. Chester stood and tentatively put his weight on it. It felt fine! He was relieved! Norman was trying to shake off the mud from his paws when Chester did a terrible thing. He shoved Norman and ran off up the hill to the route to finish the race! Norman shook his head but ran to catch up. Soon they were neck and neck again. “Hump, I would have beaten you if I wouldn’t have gotten injured.” said Chester even though his paw was just fine. 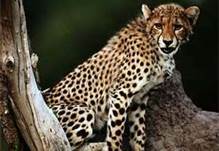 That night Chester lay by himself upset and overhearing the other cheetahs who were laying together talk about the race. To the cheetahs, Norman was a hero for saving Chester from being stuck under the tree and for tying the race. Norman was trying to make light of the event saying he just did his best. He repeated he was not a hero just a fellow Cheetah helping another Cheetah. Chester kept hearing those words repeated in his head all night. He slept poorly. The next morning, at first light, he took off at a fast run. He ran and thought. At the end of his energy, he plopped down on the ground. He was finally seeing things clearly. He saw how all the Cheetahs liked Norman. He remembered how Norman had helped him. He realized Norman didn’t want glory or praise. Chester remembered when he was a cub and had many friends. How he was hugged and loved on by his parents. The times he slept in a group of his family instead of all alone. He also remembered the times when he had boasted and how Cheetahs had walked away and ignored him. He was lonely. He was all alone with no one to talk to. He had no one to play and snuggle with. He had pushed everyone away by being and acting so proud and superior. He didn’t want to act like that anymore. He wanted friends. He wanted to be liked. He didn’t care if he ever ran a race again! He got up and ran. He was running back to the coalition, back to family and friends. He was almost there when he saw an antelope. He chased it down and then did something he had never done before. He drug it to the coalition and gave it to Norman. “Here this is for you” he said. The whole group was stunned! Chester had never done anything kind before. Chester turned to the group and said, “I am sorry for the way I have behaved. I have been prideful and I want to change, starting now.” Silence met him. Smiling with a sincere smile, Chester sat down to have a meal with a friend for the first time in years. Chester still had to fight the temptation to be proud, but he had learned his lesson. Each time that pride started to boil up inside him, he would shove it down and say he was sorry as soon as he said something cruel. Do you know someone who acts full of himself or is boastful and proud? How do you think Jesus wants that person to act? Does Jesus want us to be proud? No, He doesn’t. The Bible says in 1 Peter 5:5b and James 4:6b, God resists the proud, but gives grace to the humble. Humble means: modest, meek, unpretending, or not putting yourself more important than someone else. Psalm 101:5b: The one who has a haughty look and a proud heart, him will I not endure. Proverbs 21:4: A haughty look, a proud heart, and the plowing of the wicked are sin. Haughty means: being proud with a smirk on your face and a laugh in your eyes. Proverbs 16: 5a, Everyone proud in heart is an abomination to the Lord. Abomination means to hate or despise. One of the things the Lord hates is pride and it is listed in the six things the Lord hates in Proverbs 6:16. Do you struggle with thinking you are smarter, stronger, faster, you hit the ball better, read better, look nicer, spell better, or anything else better than others? Be careful, lest you fall or are destroyed. Proverbs 16:18 says, Pride goes before distruction, and a haughty spirit before a fall. Besides God hating pride, people do not want to be around others who are full of pride. We all have things we do well or even better than others. It is okay to be good at something or even be the best at something. The important thing is how we act when we are better at something. You may be better at many things than those around you. Are you proud of that fact? Do you brag about it? Do you make others feel less than you? Do you say mean and hurtful things to others that are not as coordinated or witty or smart as you? Do you brag about being able to do something better than someone else, or are you humble? Be careful not to talk too much about your achievements. Don’t stick your chest out and get a smirk on your face. Don’t think of yourself as better than others. Just be thankful you have that special ability you have. Thank the Lord for when you win. Thank the Lord for giving you that special ability. Encourage others who are not as good at something and encourage them to keep at it and praise them for what they can do. Remember to tell the person you beat at a race or other activity that they did a great job. When you grow up, try to use your special abilities for the Lord. He made you that way. You did not get there all on your own. I’m praying for you and would love to hear from you. No matter your age, just leave a note in the comment box. Type what you want to say in the box. Then push ‘publish’. A drop down will pop up, just click on one of the ones from the list like ‘google account’. That will post it. Then I will be able to read what you said and I can comment back to you. Memorize: James 4:6b, God resists the proud, but gives grace to the humble. Or, Psalm 101:5b: The one who has a haughty look and a proud heart, him will I not endure.